After lunch and adoration of the Blessed Sacrament, we had an open discussion on the Synod at which it was good to learn from the wisdom of brother priests. As well as the formal business of these meetings, it is valuable to be able to spend time in the company of other priests. At lunch I was next to Fr Jeffrey Steel whose conversion story I followed back in 2009, Fr Hunwicke was there to offer wit and wisdom, Frs Pinsent and Holden of Evangelium, and many others whom readers will know of. Priests who agree on doctrine find it easier to be blunt to each other, so one good friend said to me that he had seen enough holiday snaps from Margate and would I please blog some more serious stuff. Point taken! Actually it has been a bit chaotic trying to settle into a new place and learn how everything works, but I think (please God) that the flywheel is beginning to slow from its peak. Nevertheless, in addition to more weighty matters, the holiday snaps will probably keep on coming - Margate is a great place and very photogenic. Today, for example, there is a glorious blue sky and I am now going to nip down to the harbour for a sandwich. 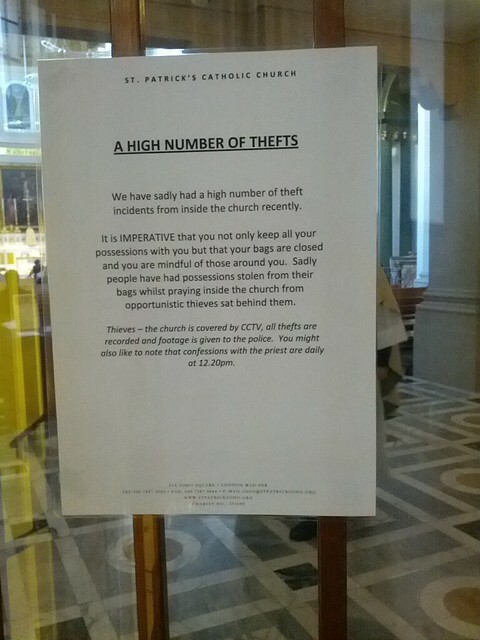 At the door of St Patrick's Church, I was amused to see this sign. It begins with a warning that is sadly commonplace in city Churches, advising people to take care of their belongings - but Fr Sherbrooke has a great twist at the end.